This issue features profiles (physical stats, history, powers & weapons, appearance list) for the following characters (“A” through “M”, only) along with the initials of those who researched their history. 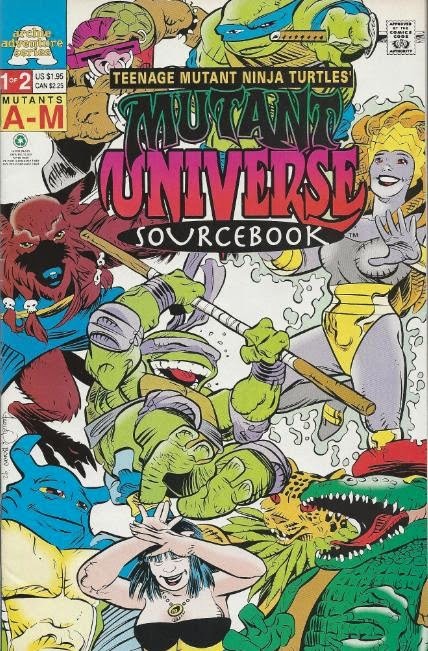 *This issue was followed by TMNT Mutant Universe Sourcebook #2. 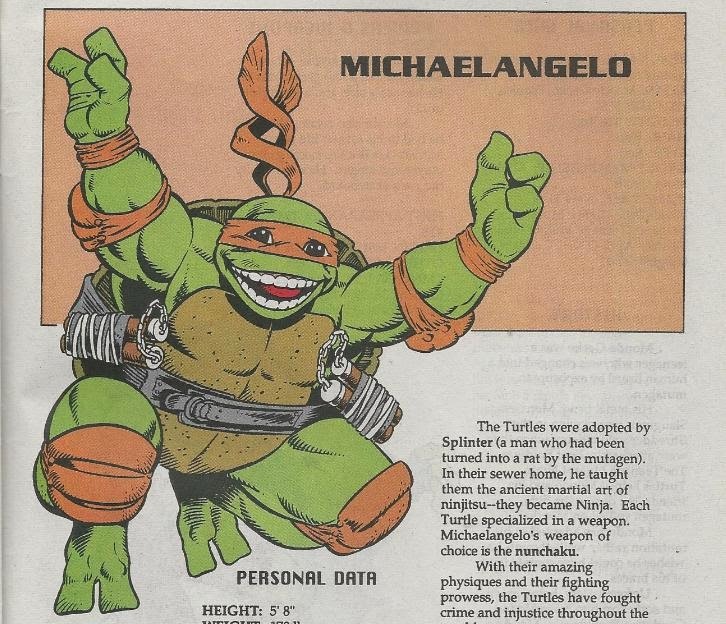 *Being released in late 1992, this issue featured info up through TMNT Adventures #39. With the advent of the internet and user-maintained free online encyclopedias with cross-referencing out the wazoo, sourcebooks have pretty much become a thing of the past. Sure, they still exist and they’re still published to an extent by certain comic book companies, but they’re just so obsolete, these days. I mean, why bother buying DK’s “Transformers: the Ultimate Guide” when you can just hit up TFWiki.net? It’s user-friendly, holds volumes more of information than any single tome could hope to contain, is constantly updated with new material to keep up with the growing franchise and…dude, it’s free. But this was 1992, and nobody who stepped out of their mom’s basement knew what an interweb was. 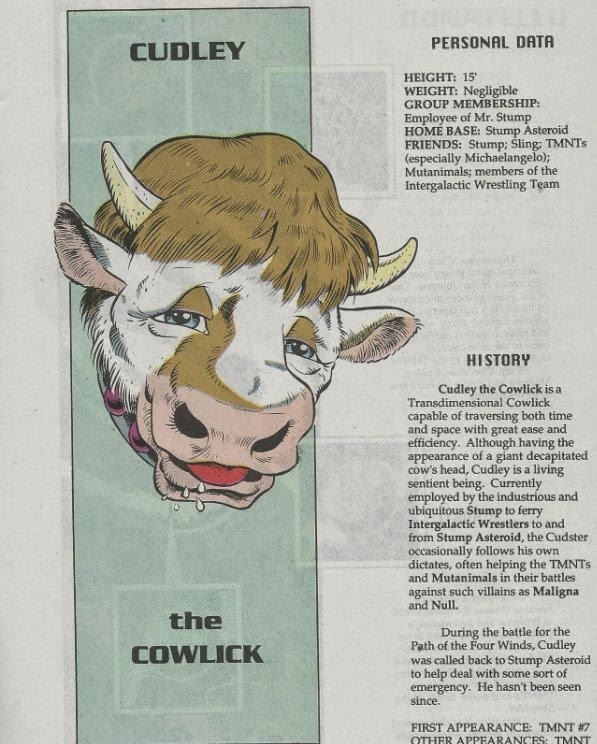 And back in those days, these sourcebooks were fantastic reference guides. And, to be honest, I still use them when writing these reviews, since they help me track what issues characters appeared in. So yay! The art for these books was provided by one of my favorite Mirage artists: A. C. Farley. Farley was an odd choice for this book, since he was almost exclusively a Mirage guy and never really had anything to do with the Archie series. Regardless, his art is wonderful, dynamic and evenly detailed. Farley has always had an edge of horror to his style, which is one of the reasons why I liked him so much; so it’s strange to see him drawing so many whimsical characters. 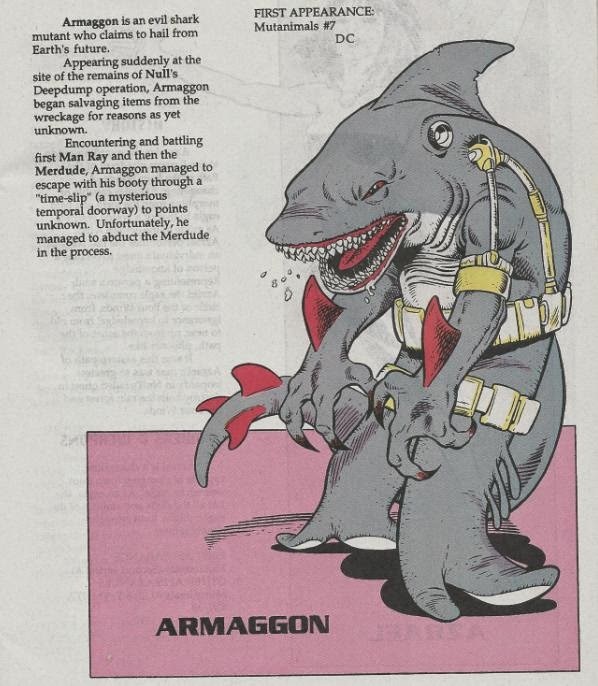 The more gruesome characters, such as the Four Horsemen and Armaggon, look appropriately frightening, while even some of the cuddly heroes have a smidgen of menace to their appearance (if it weren’t for the soulful eyes, Dreadmon might as well have stepped out of “The Howling”). Farley is one of those artists that knows how to balance style with detail; characters don’t look overly smooth and rubbery, but they aren’t filled out with needless cross-hatches and grotesquely intricate musculature. They’re “just right”. So far as the writing goes, these are mostly capsule profiles and don’t go very in-depth on the adventures the characters have been on. You have the standard set of stats (height, weight, hair and eye color, etc), which are cool if you’re into that sort of thing, as well as a section on powers and weapons. 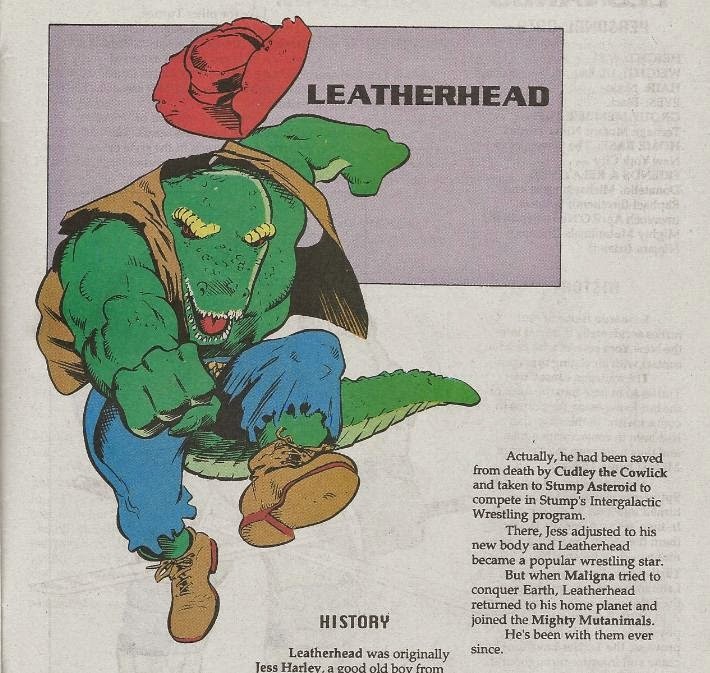 The character history is basically a run-down of their origin and how they met the Turtles. Some have a “Currently…” paragraph at the end, while others do not, making the then-present whereabouts of certain characters a little uneven. On the bright side, the book features a list of appearances for supporting characters and villains, which are broken down between their first appearance, their origin issue and all their other appearances. It’s a handy guide for referencing the chronology of a character and possibly the most useful aspect of the title; at least where writing this guide is concerned. As far as the layout goes, this issue is fine. I did have problems with future issues, but I’ll remark on those when they crop up.